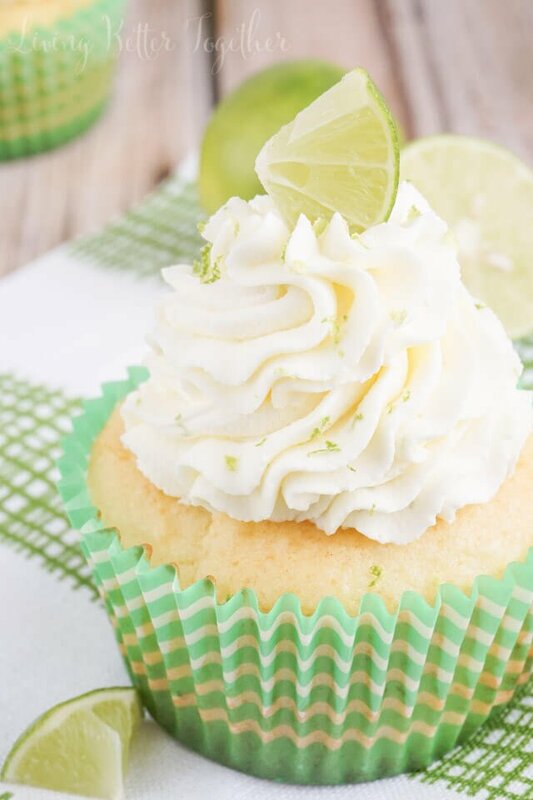 These Key Lime Pie Cupcakes are light and fluffy, filled with sweet key lime curd and topped with a whipped vanilla lime frosting! Can you say “HELLLOOOO, Summer”! That’s pretty much what these cupcakes are, though I actually made them back in March when summer was still but a dream. But it seems it’s finally arrived here in Maine. It was so nice to get back from Europe Sunday and walk off the plane to a gorgeous 75 and sunny day. Oh yeah, that’s right guys! I’m hoME! As wonderful and amazing as our trip was, it’s good to be home and sleep in our own bed with our fluff ball of a golden retriever at our feet. Okay, now I’m dreaming. I think Shoester has been allowed to sleep in our room all of 10 nights since we brought him home more than 4 years ago, but there will definitely be lots of couch cuddles. I REALLY missed my pup, ya feel me? Anyways, later this week I’ll start posting about our trip, doing one post a week on each area we traveled, sharing all of the details on where we stayed, what we did and what we ate. Plus lots and lots of photos of the amazing scenery! Okay, so let’s get down to business, THESE CUPCAKES! 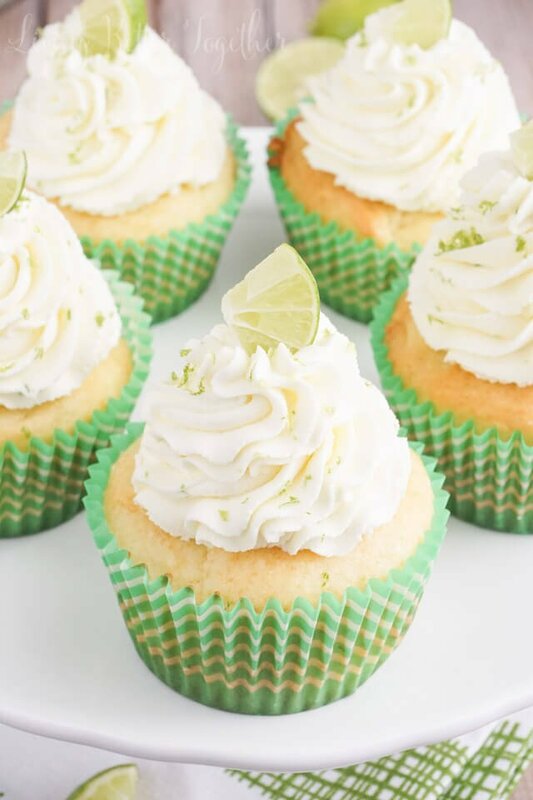 They’re incredible, so full of zest and bright key lime flavor. They’re a great summertime cupcakes, then again, any kind of cupcake is good any time of year, don’t you agree? 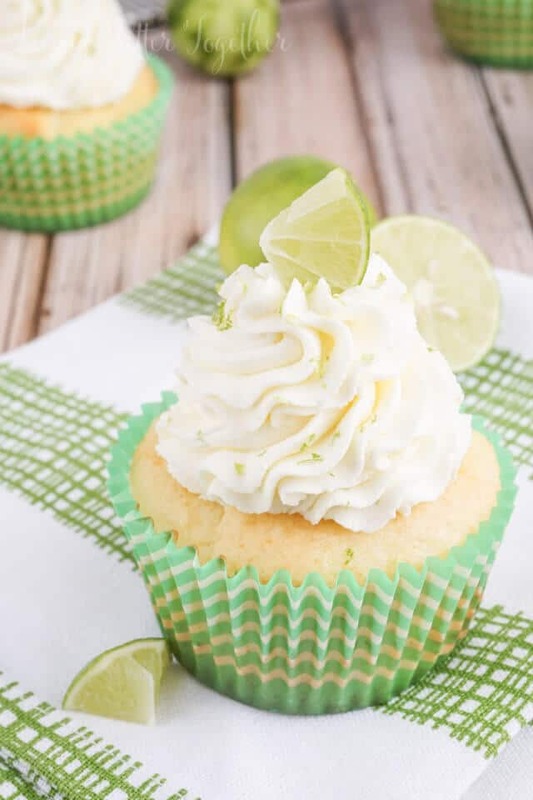 These cupcakes are filled with a key lime curd and topped with a whipped frosting making them reminiscent of a key lime pie. I made these for a co-worker’s daughter’s birthday party and she said they didn’t last long, they were even more sought after than my Chocolate & Peanut Butter Surprise Cupcakes, and those are an all time favorite! Line cupcakes pan with liners. Add cupcake ingredients one by one to a mixing bowl or stand mixer, mixing between each addition. Fill cupcake liners 2/3 full and bake for 17-20 minutes until toothpick comes clean. Transfer cupcakes to a cooling rack and allow to cool completely. Meanwhile, prepare Homemade Key Lime Curd. Once cupcakes have cooled and curd is finished, use a cupcake corer to remove the centers of the cupcakes and spoon in some curd to the center of each cupcake. Combine frosting ingredients in a large bowl or stand mixer fitted with whisk attachment and beat until light and fluffy. 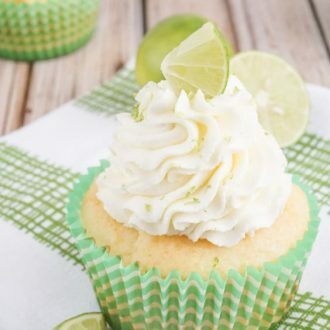 Pipe frosting onto curd filled cupcakes and top with extra zest and a lime slice. If you can't find Key Lime Yogurt, plain or vanilla can be used as a substitute, as well as sour cream. I love all things key lime! These look amazing, I can’t wait to make a batch! Oh my gosh, Rebecca! Send me a dozen of these!! 😀 These pretty babies will definitely be happening this summer! Thanks so much for joining us at Freedom Fridays – pinned and scheduled a FB share! How long can these cupcakes set out and what is the best way to store them? Thanks for posting this recipe. Can’y wait to make them. 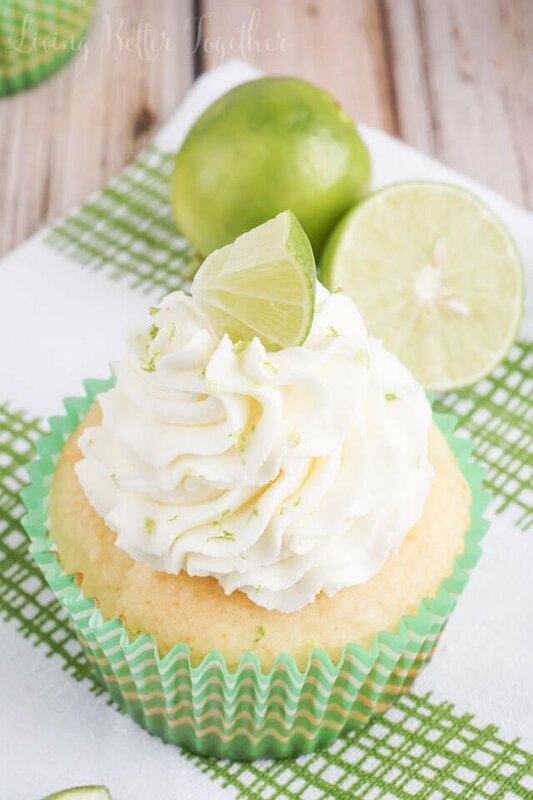 Just love, love key lime. Grew up having my grandmother’s pies. We used to go to Key West every summer and pick bags and bags of key limes. We had family there and they had key lime trees in their yard. My grandmother would juice the limes and then freeze it so that we would always have some. Because of the frosting, they really shouldn’t sit out more than the day you made them, if you need to, store them in the fridge. Hi Rebecca, I am planning to make this, but will need to do it as a cake, (2 layers, 9 inch round pans, with the key lime curd in between). Do you have any suggestions for adjusting the baking time (and if necessary, the temperature)? 9-inch cakes usually take between 30 to 35 minutes to bake, so I would start there and just keep checking until a toothpick comes clean from the center. Just make sure that you don’t open the oven until they’be been baking for at least 20 minutes.